The first ever adult Speartooth Sharks have been caught and satellite tagged by CSIRO scientists working in remote Cape York. The elusive shark species - listed as critically endangered - was discovered in the Bizant River on the eastern side of Cape York in Queensland in 1982, but up until now only juvenile specimens had been observed. The two adult specimens captured were well over two metres in length. Before that, the largest recorded Speartooth Shark was only 189cm long. 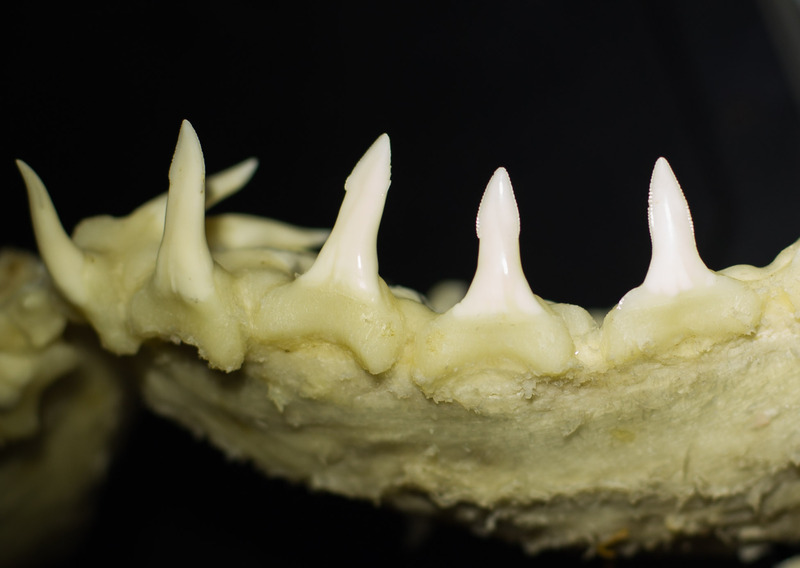 Very little was known about the Speartooth Shark until research led by CSIRO in 2004 began to obtain a better understanding of the distribution of juveniles in a few river systems in tropical Australia. “We’ve been conducting research into the movement and population status of juvenile Speartooth Sharks in the Wenlock River since 2006, and due to our long-term research we now know that juveniles are restricted to a few river systems in the Northern Territory and Queensland,” CSIRO researcher Dr Richard Pillans said. “But the lack of records of adults is a key gap in our understanding of this species, which is listed as Critically Endangered by the Environment Protection and Biodiversity Conservation (EPBC) Act." According to Dr Pillans the chances of catching the adult specimens were incredibly small. “We know from catching newborn Speartooth Shark with open umbilical scars in late October – December that the females are giving birth during this period, with preliminary estimates of total female adult population to be less than 500 sharks,” he said. Despite these low odds, over nine days of intensive sampling Dr Pillans, Barry Lyon and Luke Burnett (Australia Zoo) managed to capture two adult Speartooth Sharks - the first records of adults of this species in Australia and the first live specimens recorded by researchers anywhere. While one of the sharks was a female approximately 2.2m in length, the other individual was a mature male of 2.3m in length, which was somewhat of a surprise and may indicate that the pupping area is also a mating area. “Both individuals were tagged with satellite tags that will detach after approximately two months and provide information on where the sharks have moved to in this time,” Dr Pillans said. “The tags also collect water temperature and depth which can be used to reconstruct the movement pathways and provide detailed information on the habitat preferences of this species. 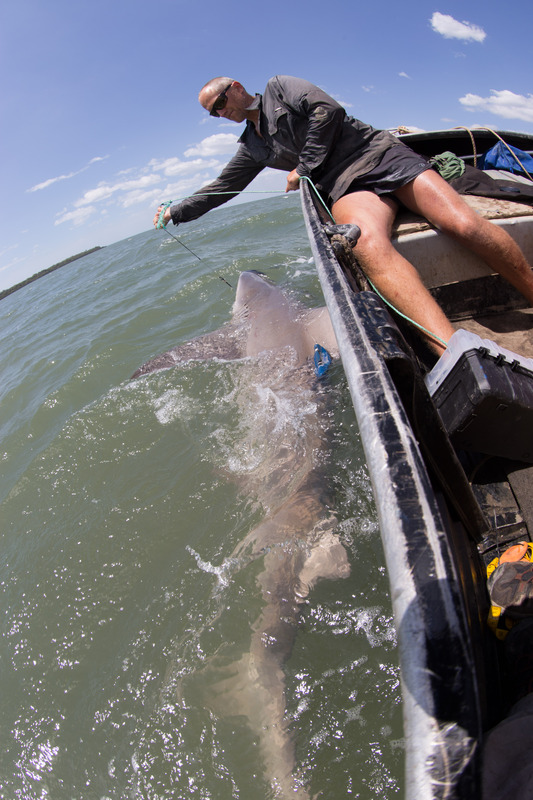 “It is hoped that the information obtained from these tags will provide the first data on where adult Speartooth Shark live, with this data critical to obtaining a better understanding of threats to this endangered species. The Speartooth Shark is a species of whaler shark and is often confused with bull sharks given their similar colouration and preference for riverine habitats. The Speartooth Shark is characterised by its dark grey dorsal colouration, a large second dorsal fin and narrow spear-like teeth in the lower jaw which is where it gets its name from. The Speartooth Shark gives birth to live young with the juveniles thought to be born at the mouths of a few rivers systems in northern Australia. Once born, the young are completely self-reliant and move upstream where they spend the next three to six years about 40km to 80km from the river mouth in water of reduced salinity. During the annual monsoon, juveniles move downstream to avoid the influx of freshwater but move back upstream once freshwater flows ease and salinity returns to their preferred range. This research is funded by research funds from the Ord River Offset program, CSIRO and is in collaboration with Australia Zoo and the Commonwealth Department of Environment .